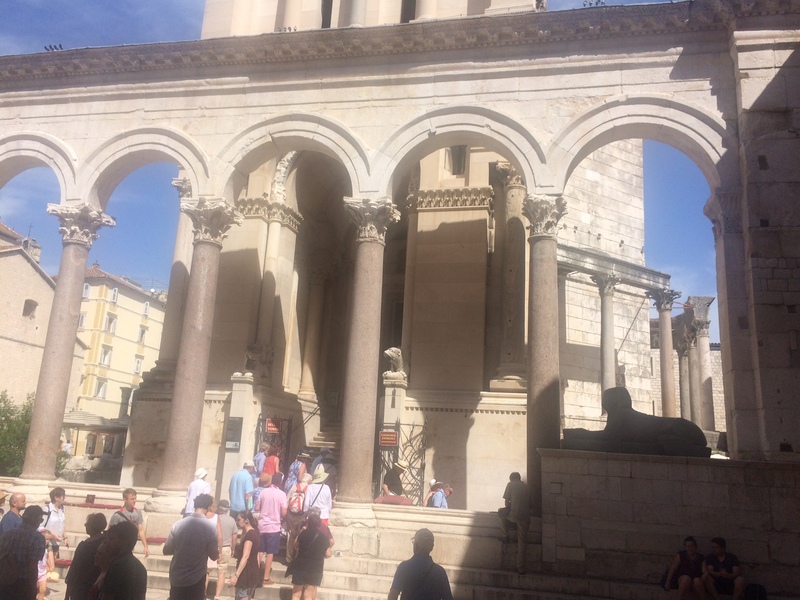 After the Apolon Cruise we returned to Split for a further five days. With hind site, three days would be fine. Croatia is very dependant on tourism. Almost all the main sea towns have an Old City. They have been wonderfully restored from, in many cases, ruins and the restorations have been going on for years. Even now, derelict buildings are being converted into modern apartments, if small, in Old Towns. 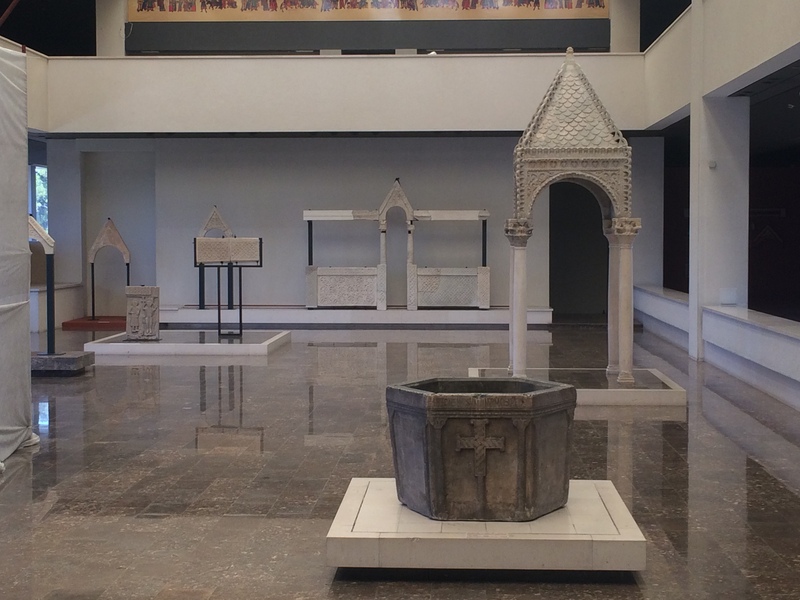 Split- Museum showing pre restored properties. One of the amazing thing about these Old Towns are the pavements. They are mainly made of marble -metamorphosed (physically changed under heat and/or pressure) from limestone. Over the ages, having been conquered by – the Huns, Goths, Vandals, Romans, Venetians, Ottermans etc – the pavements have been worn smooth, shiny and very slippery in rain and snow. So beware. Apparently the people living there used to throw their rubbish downstairs into the labyrinths for hundreds of years. At restoration, they were discovered by the archaeologists, dug out and repaired. Today they are lined with tourist shops as they were, and still are, the main entrance from the port. 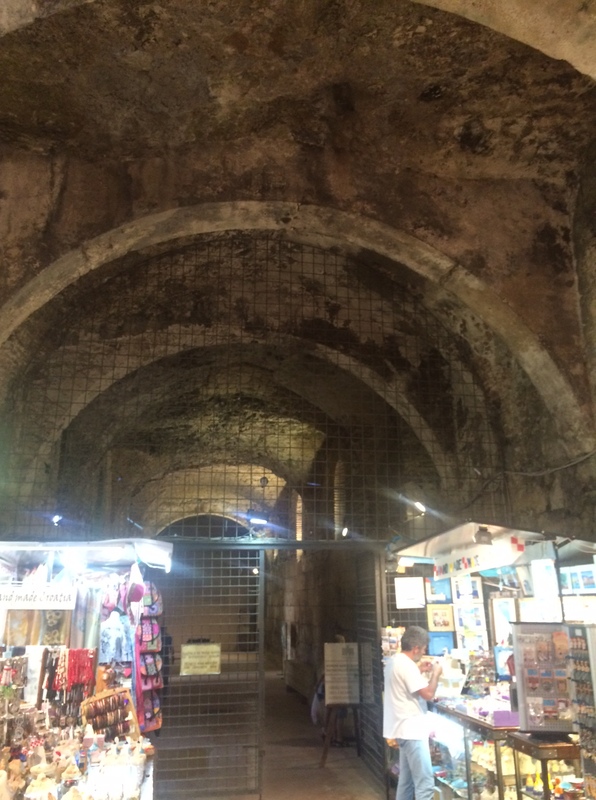 Split – Dioclesian Palace – labyrinths. Their original purpose of the arches in the labyrinth was to support the portside facade of the castle walls. 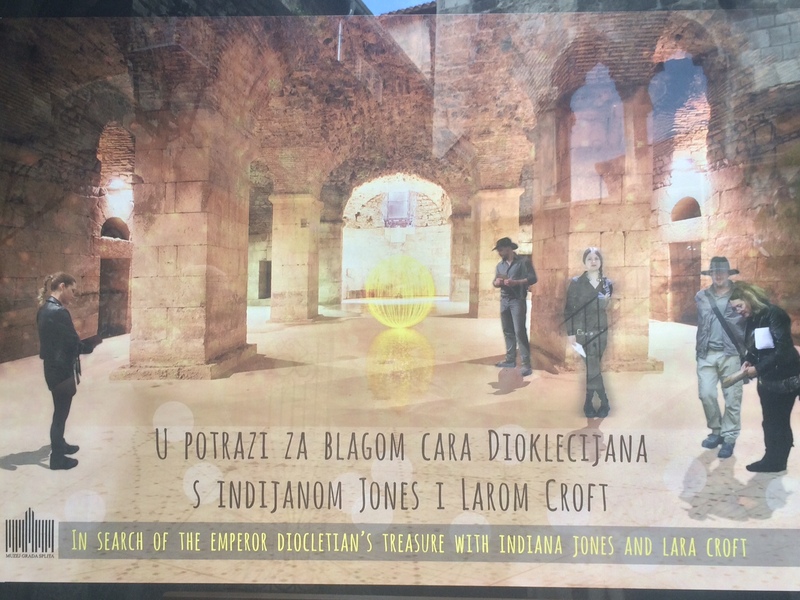 Not letting Dubrovnik have all the glory re Game of Thrones, an episode of Indiana Jones was filmed in this labyrinth. 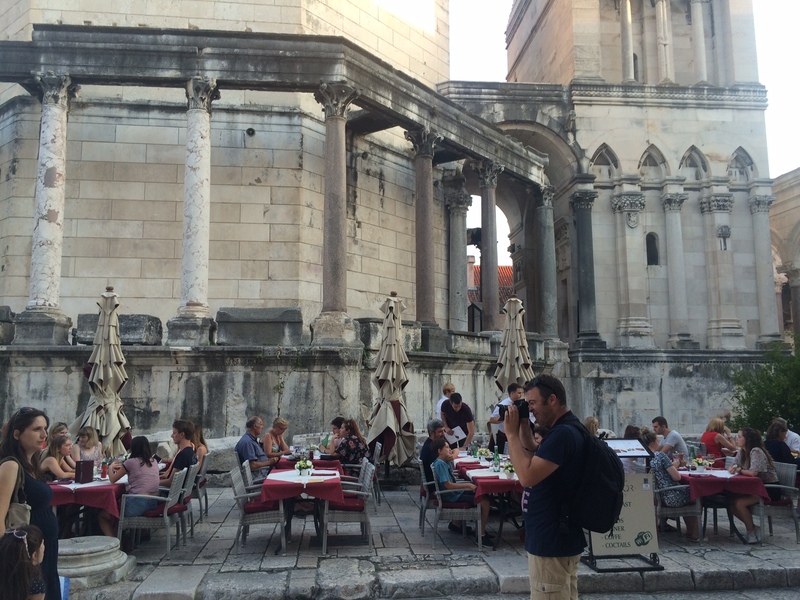 Split – Indiana Jones episode filmed here. The castle has the Iron Gate to the east and the double gate to the North for defence. The idea here was to trap invaders between the doors so the archers above could anhiliate them. The Castle was built as a Palace (retirement home) for the Roman Caeser Diocletian who was an Illyrian. Also built his mausoleum but he was the last to persecute the Christians so when they came into power, they demolished his sarcophagus and scattered his bones and turned the castle into a Christian Church. 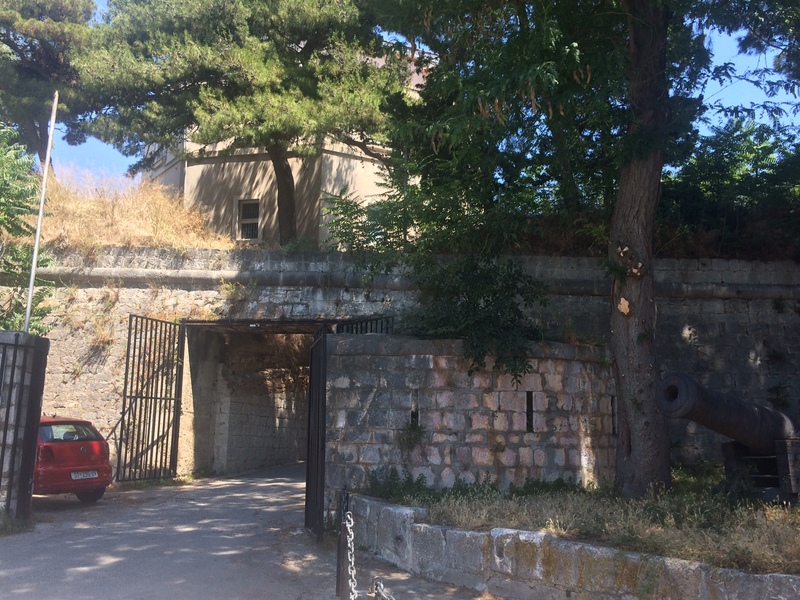 Split – Dioclesian Palace – front. 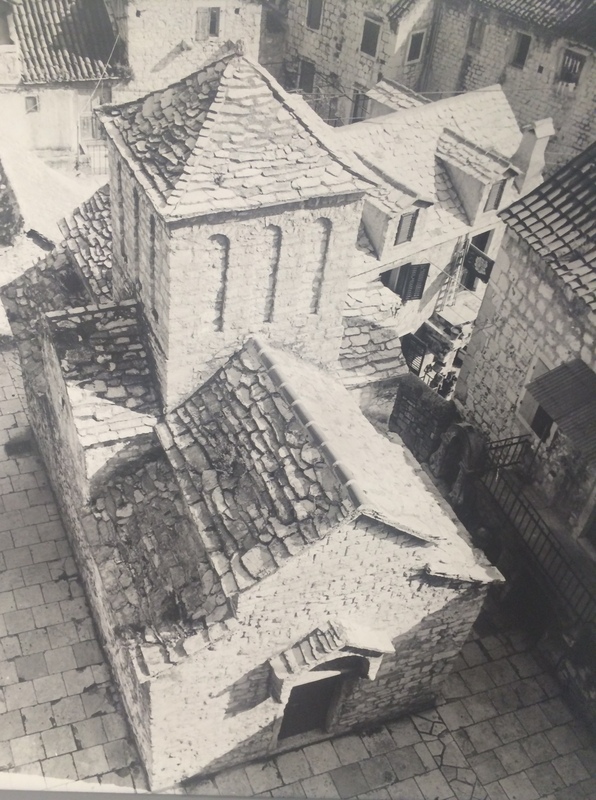 Split – Dioclesian Palace – by bell tower. 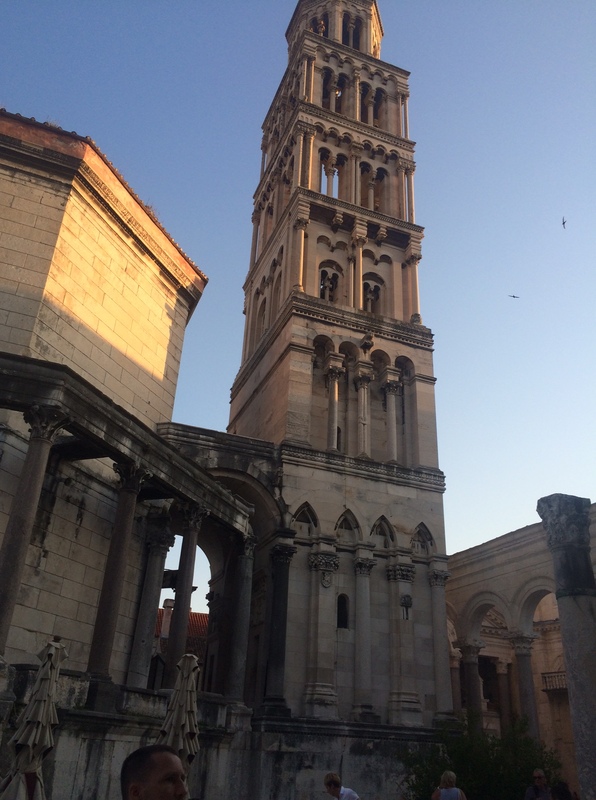 Split – Dioclesian Palace – bell tower. The Greek church was used as a baptismal font (fully immersing one). When the Croats invaded, they intermarried with the Illyrians. Situated atop a lower wall of the Diaclesian Palace is a sculpture – the Black Sphinx. This is reputed to be over 3000 years old and brought by the Romans from Egypt. Somewhat worn but imposing. 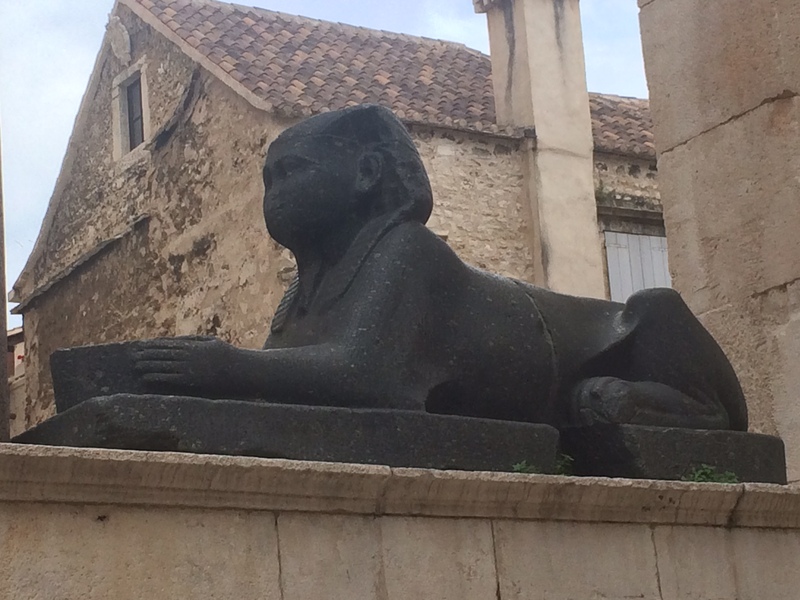 Diocletian Palace – Sphinx 3000 yrs old – brought from Egypt by the Roman Emperor. The Ivan Mestrovic Gallery is a massive building housing an array of sculptures – not being artistic, the appeal to me was limited. However on the way, we passed a magnificent bathing beach, readily accessible from Splt and where the locals go. 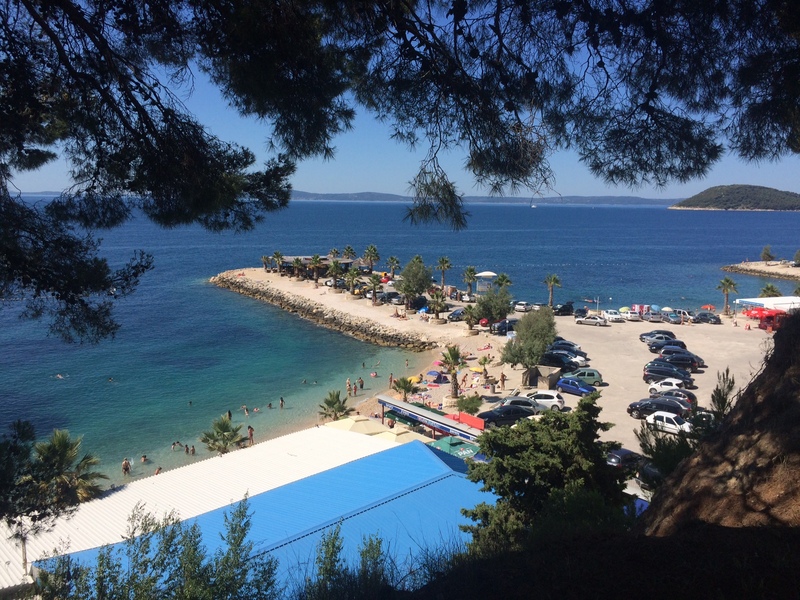 Split – a bathing paradise in warm seas. On the way back I passed Split the Museum of Croatian Archaeology. The highlight – restored stonework – done onsite – you can see what little the stonemasons have to work with, yet produce such interesting pieces. 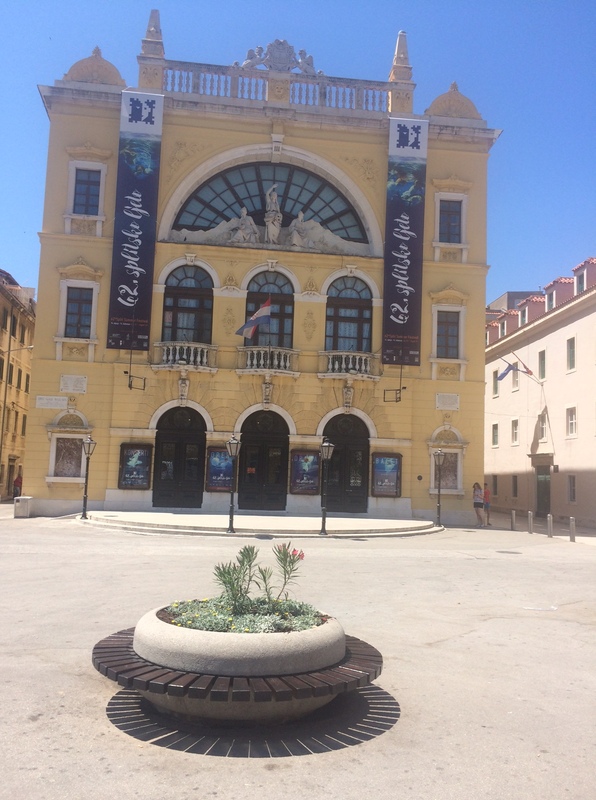 Next day – visited the National Theatre of Split. A very attractive facade to the building but unfortunately shut. Such a shame that tourists cannot see inside except during a performance. From there to the Split Maritime Museum. Highly underrated and full of boys toys. Machine guns, mortars you name it. All there. Did you know that the torpedo was invented by a Croat but could not get funding? It took a Pom to finance and develop it? That the original had strings attached to it to guid it to its target? 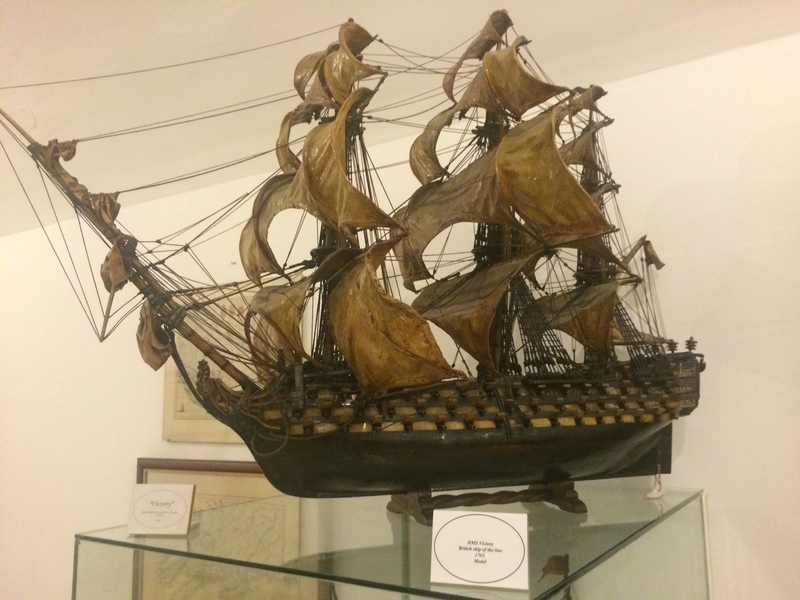 There is even a 1750’s model of Nelson’s 104 gun ship of the line – the Victory – complete with animal skin sails. The entry to the museum does not look very imposing but inside, there are 4-5 rooms with excellent displays. Well worth a visit. 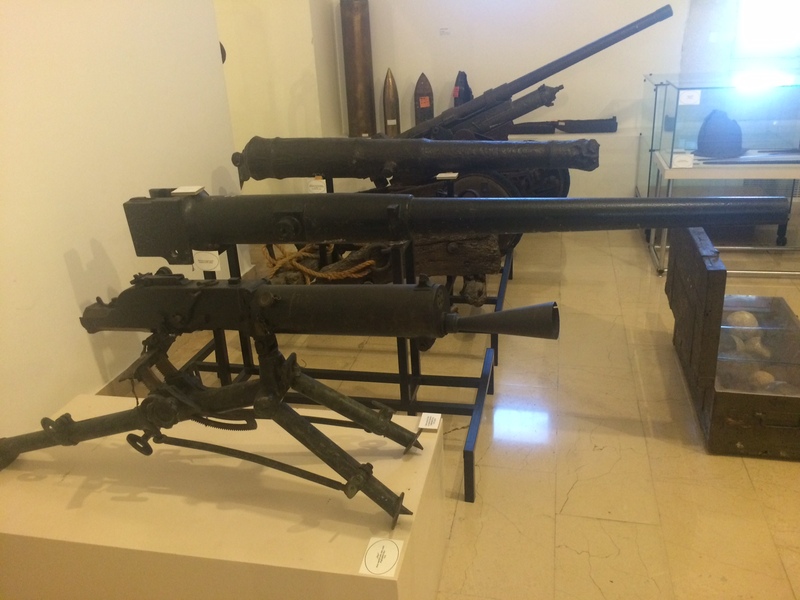 Split – Maritime Museum – guns. 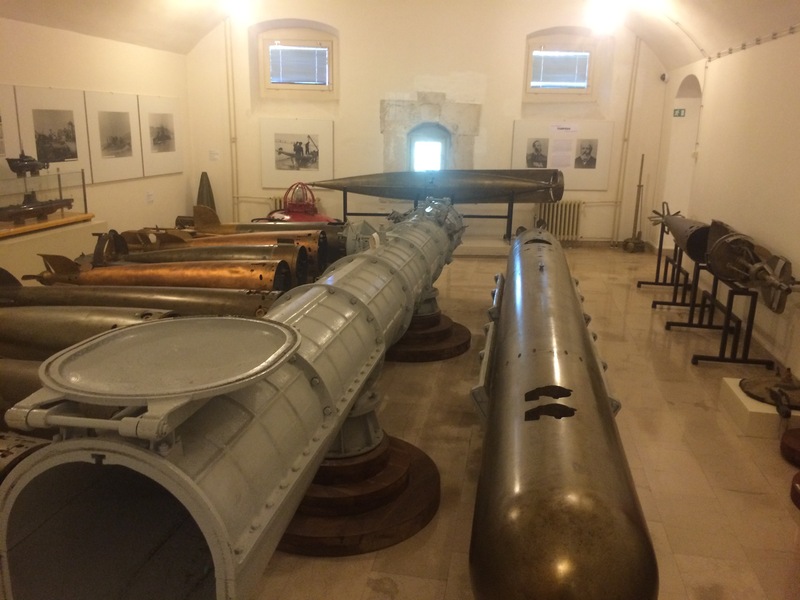 Split – Maritime Museum – torpedo room. Split – Model – Nelson’s Victory. after Dubrovnik, Split is easily the second most interesting town.